The weather cooperated and the cyclists came out in record numbers. 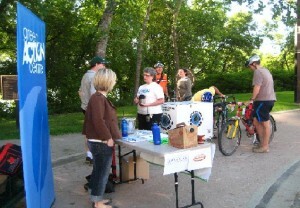 The 24 Pit Stops that were scattered all around the city were also a great success and cyclists from throughout Winnipeg were able to stop, enjoy a coffee or a snack and connect with other cyclists. Green Action Centre’s Pit Stop in Steven Juba Park (Bannatyne at Waterfront) saw well over 100 cyclists ride by, many of whom stopped to chat and enjoy some refreshments. According to the organizers of the event, registration for the event was over 2700 individuals. Congratulations to the Bike to Work Day Organizing Committee for another successful event. The Manitoba Lotteries BBQ at the Forks was also well attended with over 300 people attending. There was free hot dogs and burgers for the first 300 that arrived and of course there was Half Pints “Pedal Pusher Ale” too. It was a great way to bookmark the end of a great event celebrating cycling. We’re already excited to see what next year’s Bike to Work Day will bring!